A while back I was fortunate enough to be given a Sneeboer digging fork. Now you might think me sad but I’ve been known to drag visitors up to the shed to show them it. When I first got it, I was a little uncertain to be honest. The shaft seemed a bit thin compared with its predecessor and when I picked it up there was nothing to it. It actually weighs in at 2kg. When you think about it, the less the fork or spade weighs the less effort is wasted. You want to move the soil, not half a ton of fork. So the shaft may be thin but it’s made of ash and that’s a pretty tough wood albeit light in weight. The body and tines are stainless steel and once again lightweight but very strong. They slide easily into the soil and I really don’t think you could do better with a clay soil as it just slides off the tines. The tines are a good length (about 9 and a half inches) and the head is just over 7 inches wide, which is near perfect for my money. The handle length at three feet is perfect for today when people are taller than they were. It gives plenty of leverage and is ideal for heavy soils. The flat blades also mean that you can double it as a potato fork as well as use it for shifting manure easily. This is as near perfect a tool as I’ve ever used. The only negatives are that I find it a bit sad that it takes a Dutch company to make this Rolls Royce of a spade, but it’s been a long time since Made in Britain meant ‘the best’ and it’s not cheap. Then again, it’s a fork you buy once and will probably outlast you. As anyone reading my diary knows, we grow on stony ground. Imagine the aggregate they use in road building with some soil poured on. That’s our land. Now digging over ‘soil’ like this is a nightmare. The spade goes in maybe an inch or two before clunk! You’ve hit a rock and can go no further. Move the spade an inch and perhaps it goes in further or maybe not. Digging is just impossible. There are times when I despair – digging over just a few square yards took the best part of an afternoon and whilst the rotavator works it doesn’t go as deep as a spade. In fact repeated use of the rotavator can create a pan that really needs breaking up after a few years. 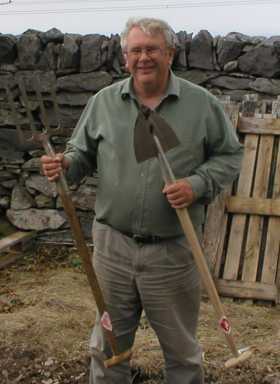 I’d tried a full sized spade, a border spade (also called a Lady’s Spade) and the fork but what I hadn’t tried was a pointed spade. Well needs must and so a Sneerboer pointed spade. Like the rest of the range, it’s as top quality as you can buy. In fact I’ve got it on good authority that some of the TV gardeners use Sneerboer. It has quite a heavy head and a little smaller than I’d like but it’s a solid piece of kit. The handle is ash again and lightweight but strong. Lovely as it is, the question is how it actually works. The truth is that it is brilliant. As you push down, unless the point hits a big rock dead-centre, the spade moves to the side and sinks in to the ground. I broke up more ground in ten minutes with it than I’d done in an hour with my ordinary spade. 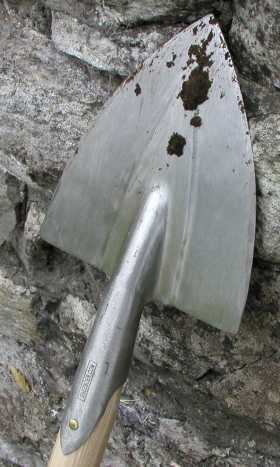 It’s not great for shovelling but that’s OK, once the soil is broken up you can use a normal spade to move the soil. At around £60 it’s a lot of money for a spade but the question is value for money and this wins hands down. Like the other tools in the range, it’s going to outlast me with a little care. 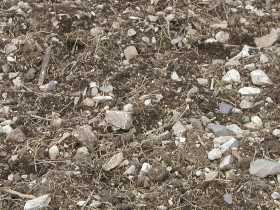 If you’ve got a rocky soil or a really heavy soil, this is the answer to your digging problems.